Join us for a monthly customer dialog to learn about the latest Symantec Endpoint Protection (SEP) Mobile features and ask any product-related questions. On 29 March 2019, we further extended the capabilities of Symantec Email Security.cloud. As a SaaS security service, it undergoes many upgrades throughout the year, allowing us to make improvements and add new capabilities. We have always understood the importance of ensuring our products are designed around the user’s needs. This is critical as our customers rely on Symantec to provide a highly practical solution. Millions of new URLs are created every day. Traditional URL filtering using categorization can’t keep up with the websites that may only exist for 24 hours or less. Learn how new AI engines in the Global Intelligence Network take website metadata and generate a threat risk level for every new URL, giving you crucial information for policy decisions on web access. Learn about Threat Risk Levels in this upcoming webinar. 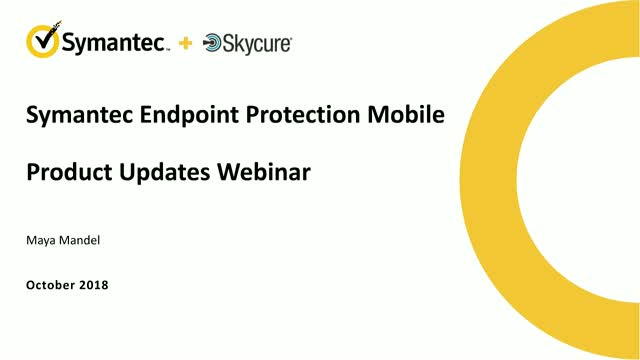 Join us for a periodical customer dialog to learn about the latest Symantec Endpoint Protection (SEP) Mobile features and ask any product-related questions. Cyber attackers are using sophisticated automation tactics to quickly find and exploit weaknesses in organizational defenses. Normal response tactics fail to mitigate or stop these “machine speed” attacks. The information necessary to address these attacks is often in different security tools, none of which are easily connected and coordinated. In this webinar, you will learn how Symantec and Splunk products address this problem by working together to automate a complete, closed-loop security system. In this webinar, we’ll go in depth on Symantec Email Fraud Protection, a new automated DMARC enforcement solution that provides another layer of defence to eliminate the single biggest phishing attack vector: exact-domain impersonation. In this webinar you will learn how to utilize Symantec’s Web Security Service in order to secure your day to day interactions with the Internet. In this webinar, we’ll explore the Policy Based Encryptions service – highlighting how it works, how to trigger a policy, and the user experience. We’ll also cover advanced features and industry best practices to equip you with the tools needed to protect your organization. In this webinar you will learn how to utilize and configure Symantec’s CoudSOC service to protect access to an Office 365 SaaS environment. The purpose of this webinar is to make sure our ATP Email customers are aware of all the services within this solution and that they are configured to our recommended best practices. Adoption of cloud services like Office 365 adds simplicity to business services. However, it has also added significant complexity to the traditional security infrastructure. This technical webinar will teach you how to utilize the Symantec Email Security.Cloud service to protect against advanced threats. Join us for a monthly customer dialog to learn about the latest Symantec Endpoint Protection(SEP) Mobile features and ask any product-related questions. In today’s cloud era, organizations must adapt to new cloud based solutions quickly in order to enable their business. Unfortunately, securing data becomes an afterthought. This technical webinar will teach you how to utilize the Symantec DLP solution to secure your data. In 2018, organizations worldwide are expected to invest up to $93 billion dollars in security solutions to protect their users and data. Yet, most companies are still vulnerable to the latest cyber-attacks and breaches, in no small part due to service misconfigurations. Attackers are looking for systems that have default settings that are immediately vulnerable. 2. Highlight the key protection features that every organization should enable to protect themselves against malware, phish and spam emails. Take full advantage of the industry’s most complete email security solution by properly configuring your Email Security.cloud solution. Spear-phishing emails emerged as by far the most widely used infection vector in 2017, employed by 71 percent of targeted attack groups according to findings in our latest Internet Threat Security Report. - How to optimize the configurations of your Email Security.cloud service to protect your organization. Deception is a new features of SEP 14.1. Learn how to deploy and utilize this unique feature to identify hackers and remove risks. Symantec Technical Webinars connect you with leading product experts, to keep you informed on the latest product features and enhancements, and to equip you with field tested best practices on how to configure and maintain your products and to make the most of your Symantec solutions.